Our Control Paladin deck list guide features the best Rastakhan deck list for Hearthstone (December 2018). Our Control Paladin guide also contains Mulligan advice, card combos and strategy tips. Control Paladin is a Hearthstone deck that's all about playing the long game, so if you’re after a deck that’s going to give you quick wins to climb up the ladder then you might want to look elsewhere for something speedier. Fans of a slower, control-oriented approach, though, will find something to love here. Still, there are unique challenges and a whole different mindset to enter when playing this deck, so prepare for a bit of a learning curve if you’re new to the archetype. It's not a particularly easy deck to play well, but in skilled hands Control Paladin can be devastating. There are also a few variants, including One-Turn-Kill (OTK), Fatigue and Cube Paladin, that you can choose between to narrow your play style down even further. 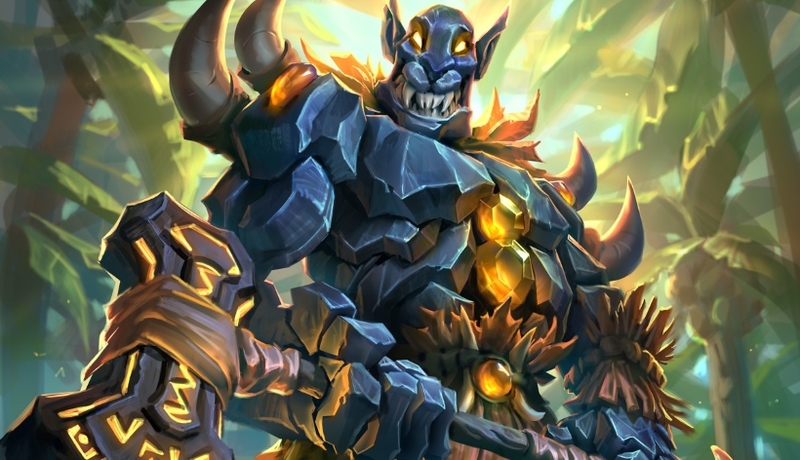 In our guide to playing the deck type, though, we’re looking at just one theoretical list that we expect to see play in the upcoming Rastakhan’s Rumble expansion. There are many cards in the new set that slot elegantly into the list, so we’ll be breaking down how the new deck will work below. After that we've got everything from handy Mulligan advice, a complete breakdown of all the card synergies involved, and strategy tips for handling the opponents you’ll come up against on ladder. Here is one version of Control Paladin by Toomsday we expect to see play in Rastakhan’s Rumble. As it becomes more refined over the early days of the expansion’s life cycle, we’ll be sure to update this page with the most up to date list. The aim with Control Paladin is to keep your opponent in check throughout the early game as you slowly increase in power with your mid and late-game cards. You have more than enough ways to continuously wipe out your opponent’s board, and starve them of resources while setting up your own powerful plays for later in the game. Once you start to establish yourself there’s little they can do to contest. Rastakhan’s Rumble adds a number of new cards that work well in this deck. Most notable of these is Immortal Prelate, which is shuffled back into your deck while retaining all enchantment effects when it is killed. Using buffs such as Spikeridged Steed, you can improve these into powerful two drops that you can then immediately draw onto the board using Call to Arms for big tempo plays. Meanwhile, Da Undatakah can be combined with Carnivorous Cube to create even more strong late game minions that you can repeatedly draw from your deck. Early game: Take a heavy control approach in the early game, using your low-cost Taunt minions and valuable weapon attack to slow aggressive opponents. You should be able to put up enough of a wall using Stonehill Defender and Corpsetaker to keep yourself protected. Immortal Prelate is a minion you can play to gain some desperate board presence, as it’ll only be shuffled back into your deck, but it might be worth saving until later in the game when you can buff it at the same time. Mid game: If you’re being massively overwhelmed on the board, then your most powerful board clear with Equality and Consecrate - or Wild Pyromancer - can come into play at this stage of the game to wipe everything out. Shrink Ray can also be used to nullify a lot of your opponent’s power should you be missing a piece of that combo. You’ll want to start looking at buffing cards like Immortal Prelate now with Spikeridged Steed so you can start building your late-game power plays. Even if you’re unable to land the buffs on them, it can be worth targeting them with Carnivorous Cube so you can get more copies filling up your deck to summon later on using Call to Arms. Sunkeeper Tarim can then be used to give them an attack buff, or to weaken your opponent’s board if you're desperate. Late game: If you’ve kept your opponent under control throughout the rest of the game there’s a good chance they'll be running low on resources now, and you can start to swing the match more heavily in your favour. Large late-game drops such as Tirion Fordring and Da Undatakah will be a problem for them to deal with easily. The latter gains some excellent bonuses if any copies of Immortal Prelate and Carnivorous Cube have died this game – or if it gains the Deathrattle effect from Tirion Fordring. Another win condition is presented to you through the hero power of Uther of the Ebon Blade. If you still have a lot of Taunt minions or board clear effects in hand, you can sometimes find the time to summon all four horsemen and win the game that way. You also have some powerful comeback cards in Zilliax and Shirvallah, the Tiger if you need to quickly clear off any remaining threats from your opponent, while granting yourself a bit of healing at the same time. 1. You have a lot of ways to deal with aggro opponents in the early game, most notably your army of cheap Taunt minions that will stop their creatures in their tracks. 2. The deck is filled with many board clears, but try to save them for use as late in the game as possible. If you wait an extra turn your opponent may commit too many minions to the board and you can get some extra value. 3. Truesilver Champion is also an excellent way to fend off the smaller minions in aggro decks. Do keep an eye on your health, but know there’s some healing later in the deck which can restore it. 4. Speaking of that healing, both Zilliax and Shirvallah, the Tiger are Rush minions with Lifesteal, meaning they can have an immediate impact when played to remove troublesome creatures your opponent has on the board. 5. Your aim against aggro is to starve them of resources, so don’t rush into playing your creatures unless you desperately need something on the board to contest. Best to save them for later when they can be buffed up and your opponent has no response. 1. Expect to see the first few of your big plays dealt with by all the removal that's available to control decks. It’s not too big of a concern, though, as you have many ways to generate big board presence. 2. Conversely, you have some serious hard removal of your own that can deal with the biggest threats these late-game heavy decks have access to. 3. Many of the Lifesteal effects in the deck from Uther of The Ebon Blade, Zilliax and more will ensure you’re able to contest way into the late-game. 4. You can use some of the deck’s smaller Taunt creatures to protect your life total against hits from larger minions. Those with Divine Shield will give you even more protection, and can be frustrating for opponents to get past. 5. Be cautious of Silence effects that many control decks run. Having this land on a copy of Da Undatakah or Immortal Prelate can kill a lot of the deck’s potential. Try and bait out what you can. 1. Righteous Protector: Cheap Taunt minion that’ll give you some early board presence and can stick around for longer thanks to the Divine Shield. 2. Wild Pyromancer: A solid minion on its own, but you’ll want to combine it with Equality or Shrink Ray for the best effect. 3. Stonehill Defender: A decent Taunt minion that allows you to Discover another Taunt minion. There’s a good chance you’ll find another Sunkeeper Tarim or Tirion Fordring off this. 4. Truesilver Champion: Allows you to eke out a lot of value from weapon attacks against weaker minions, while protecting your own creatures. 5. Call to Arms: Represents a lot of value and tempo if you can summon three of your minions that cost less than two mana. - You can create a total board clear - Divine Shield effects aside - by putting Wild Pyromancer into play, then casting Equality or Shrink Ray. Every minion will be reduced to 1 Health, then blasted off the board. - The same effect can be achieved by playing Equality, followed by Consecration. In this instance, your own minions remain alive with point of Health each. - Remember that the effect of a spell goes off before Wild Pyromancer applies his point of damage to all minions. - Make sure your hand is empty of weapons before triggering the Deathrattle effect of Tirion Fordring. - When played, Sunkeeper Tarim sets the Attack and Health values of every minion (except himself) to 3. This can be a great way of bringing an opponent down to size, or just empowering your own very weak minions. - Spikeridged Steed and Immortal Prelate are the perfect pairing as the latter will retain the enchantment effects even after dying so you can play an already buffed version once you draw it from your deck again. - The Stegadon spawned by the Spikeridged Steed spell is a 4 Mana 2 / 6 Beast with Taunt. - Once you've switched Hero by playing Uther of the Ebon Blade, you'll gain a new Hero Power which lets you summon one of four Horsemen of the Apocalypse. Get all four of these 2 / 2 minions out on the board at the same time and your opponent will be instantly obliterated. - Da Undatakah will gain the Deathrattle effects of three friendly minions that have died throughout the game. If you can, try to ensure the likes of Immortal Prelate, Carnivorous Cube and Tirion Fordring have already been summoned and killed before playing the new Legendary. Wild Pyromancer: The perfect card to pair Equality or Shrink Ray to give your a devastating board clear effect. Immortal Prelate: There’s minimal buff effects in this version of the deck, but there’s still repeated value to be found with this new minion that stretches far into the late game. Corpsetaker: An excellent four-drop that will gain a whole range of bonus effects as the deck features minions that sport every single one of the additional keywords. These are up for removal if you want more Control options with Doomsayer or Lay on Hands. Call to Arms: Allows you to Recruit a lot of minions from your deck if you haven’t drawn them into your hand yet, or you can pull buffed copies of Immortal Prelate that have been shuffled back into your deck. Shrink Ray: Another way for this deck to nullify the power of your opponent’s minions. Two copies might be a bit extreme, so you can swap one out for a card like Crystalsmith Kangor if you want more healing instead. Carnivorous Cube: This version of Control Paladin uses Carnivorous Cube to get a lot of value out of powerful Deathrattle effects available to the class. You can swap these out for cards such as Augmented Elekk or Elise the Trailblazer if you want to play more of a Fatigue oriented version. Zilliax: A strong Rush minion that allows you to immediately respond to a threat from your opponent while also gaining some health back. Sunkeeper Tarim: Not only capable of powering up some of your weaker minions after a Call to Arms on turn five, but can also serve as a way to weaker your opponent’s board too. Tirion Fordring: The long-standing Paladin legendary finds a place in this deck too thanks to its base power level and strong Deathrattle effect. Da Undatakah: This new legendary can take advantage of the handful of strong Deathrattle effects in this deck to have a serious impact on the game. Uther of the Ebon Blade: The weapon this hero card comes with is great in the late game, plus you also gain an additional win condition through the new hero power. Shirvallah, the Tiger: Offers similar functionality to Zilliax as a Rush minion that can have an immediate impact on the board. Can be made an even stronger tempo play if you discount it with enough spells. @Silversword107 Yeah the Legendary-creep is real. I hope they change the Legendary distribution for the next rotation. Honestly though, I love playing paladin, but I have trouble keeping up with all the legends! I was able to play the last decklist, but now since they are adding in all the neutral legends( I have almost all paladin ones) I don't know if I will be able to enjoy one of my favorite deck archetypes(Control Pally). This deck has now been updated for the month of September 2017. Any comments appearing above this one refer to a previous version of the deck, and certain discussion points may no longer apply as a result. @mikekoopmans50 I was not lucky with the 150 packs I opened this morning tbh, and I'm going to have to be very selective with what I play - at least until I've smashed through a lot of Arena games for new packs. "Every Deathrattle minion that is killed - not silenced or transformed - during the course of a match will be resurrected when N'Zoth, the Corruptor is played." Silenced minions still come back with N'zoth, it's only transform effects that prevent deathrattle minions to come back. This is a pretty serious mistake on the guide guys.